This flowering plant can be propagated by rooting a slip. 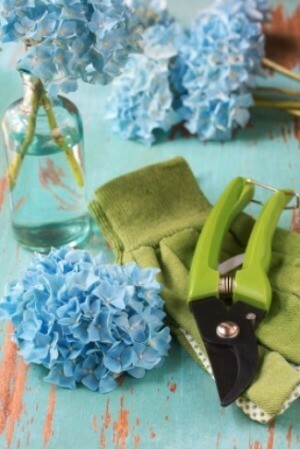 This guide is about growing hydrangeas from cuttings. A neighbor of mine asked if I could give her a cutting to root from my hydrangea. It is the type that has the "flat blooms." I have the rooting hormone to dip the cutting in but want to be sure where to take the cutting from the plant and if I can take it in now, in the fall, and possibly start it through the winter. I have a bay window that has wonderful southern exposure. I'm unclear of the zone you're in, but if you're want to start hydrangeas indoors from stem tips this fall go ahead and try it, otherwise, wait until May or early June and your neighbor can take a cutting and plant it directly outdoors. Hydrangeas usually need 6 weeks of temperatures below 65 degrees to set buds, followed by at least 6 more weeks of night time temperatures of 35 to 45 degrees. Eighty or so days after this, they flower. Rooting them indoors will work fine, but expect them to take a year or two after you transplant them outdoors to get back on track before they flower. Take a cutting from the tip end of a branch that did not flower this year (5-6 inches long). Make sure the branch has stopped growing, but isn't yet brown. Remove the lower leaves to expose the leaf nodes. Cut the largest of the remaining leaves in half. Insert the stem (dipped in rooting hormone) into a pot of moist, well-drained potting soil. Cover them with plastic, using stakes to keep the plastic from touching the leaves. Keep them in full light, but out of direct sun. Use caution with your south-facing window as the light could be too strong. Now is the very early SPRING time to use "willow water".........if you have access to a weeping willow tree, you can make willow water to root your cuttings, it's natures rooting compound, no need for purchasing hormones. The easiest way to root hydrangea plants is to scrape a small section of bark off a lower branch, bury that section in the ground with it still attached to the parent plant and weight it down with a small rock. The next spring you will have a rooted plant and can cut it loose from the parent plant and transplant it elsewhere. I have a yard full of hydrangea plants using this method. I do this also. When you cut the new plant from the momma, leave it for a few weeks before transplanting. This reduces the shock and encourages strong roots on the new plant. Works like a charm. My mom has hydrangea clippings but they are not rooted. She currently has them in water, but what does she need to do to plant them so they stay alive, or is it possible? I did it. Here's what I did. I pulled bottom leaves off. Then, rubbed honey where the leaves were. The hormones in the honey ignite the rooting to start. Planted it straight in dirt at an angle, not straight up and down. Make sure you put the part of the stem where the leaves were in the soil. That's where the roots will come out. Keep moist. I learned this from a 77 year old friend of mine : ), you can root almost anything this way! I left them in water until they had roots that were nice and long. It took a while as I remember. Then I planted them. 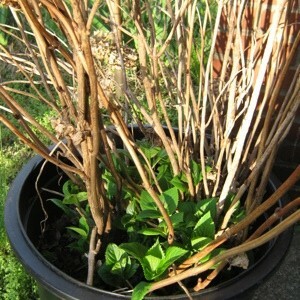 That was ten years ago and the two little stems are now two very good sized plants. They have about 15-20 blossom heads each, every season. They need a lot of watering but you can see when it's time to water by the drooping! Also they like acid fertilizer. Good luck. I'm from the Eugene area too. When my Mom moved I took several cuttings of her old lilac bushes. I kept them in big buckets of water outside for a year before I planted them and they did just fine and are beautiful lilac bushes now. I've had good luck with just clipping rhododendrons and azaleas and sticking the clippings into the soft earth somewhere in my yard. You might want to try that with hydrangeas to see if it works. I've been told it works with old garden roses. I must try your idea Debbie. I got this info from an elderly friend also. I have used this method for years and always have good luck with it. You can pull a branch down to a small hole in the ground beside or under the bush that you wish to root, cover it about middle of the branch with dirt leaving the outer end exposed. If the branch won't stay buried, place a rock or brick on it to hold. I have given my daughter a hydrangea, snowball and forsythia for her new house this way. My grandmother called this brick rooting and she did not even bury it, just placed a brick on the branch to keep it in contact with the dirt. I usually do this in early Spring and don't dig up until Fall or the next Spring. When you can tell that it is rooted, cut from the mother plant and dig up your new baby for transplanting. My neighbor gave me a bloom to propagate a hydrangea, but I've heard they don't bloom if you propagate from an already bloomed cutting. Does this mean that even if roots appear, the plant will just consist of leaves forever? Or does it mean it'll be two years before it actually blooms? I propagated my first hydrangea from a cutting placed in a floral arrangement. I took a nice tender (not too woody, not too thin) section of the branch after the bloom dried up, removed the flower, and placed it in a pot by itself in a sunny but not too hot location and started watering and fertilizing it (I hear that there is a growth hormone you can add to it, I did not). It took off and it is huge and beautiful now. It has gone from baby pink, to bright pink and now it is a beautiful purplish blue. I was lucky with mine so maybe you can do the same. Good luck. So I have a hydrangea bloom in water now. Do I leave it until bloom dies, then plant the stem from it? I have a cutting started from a friend's hydrangea. It's still very small with only six leaves, so far. I live in zone 7. Can I plant this small cutting in the garden and will it survive this winter? If not, how do I "winter it over" in the house? Yes! I have done this many times. The last one I did was 2 yrs. ago and it is now blooming beautifully in my garden. I let it have morning sun only and when it has about 6-8 leaves on it, I re-pot it into a larger one and then in to the ground the following spring. Good luck..
About a month ago I got cuttings off of my mother-in-law's blue hydrangea and some of my own pink butterfly bush. I wanted some to use for myself and some to give to my daughter. I had them in containers of water out on my front porch. Being so busy I just put them in pots of soil yesterday to finish rooting. I noticed they had already dried up, but yet one of the blue hydrangea already had roots, and it was not really all dried up yet. I went ahead and stuck the rest as well as the butterfly bush cuttings which were already dried up, in the soil. Question is, will the dried up ones still produce roots? Or will I need to go over and cut off some fresh ones and stick those in the dirt to root? My neighbor gave me half of his hydrangea last fall and I initially put it in water for a couple of weeks before putting it into a pot with fresh dirt. When I potted it all the leaves were fading and eventually died. It wintered below my porch (while I did nothing, but pray). It was on the south side of the house. Two weeks ago I checked it and to my delight I found lots of wonderful new growth at the base although the stalks are completely lifeless. What do I do now? Beyond cutting off the dead parts I am not sure. Should I keep it in the pot or transfer it to a hole in the ground? Should I feed it or just water it? Please share your hydrangea experiences and advice. Thanks in advance. Q: I hav e a friend who has a beautiful Blue Hydrangea. Last year I had a bloom cut from it and tried to get it to root but it did not take. Any advice on how to get this to grow for me? There are two easy ways to propagate Hydrangeas from cuttings. Try both methods at the same time and one is bound to work for you. The first is to root it in a vase of water. Although this sounds easy in theory, it's unsuccessful a large percent of the time. Just stick the bloom in a vase of water and wait for roots to appear. Keep the water fresh and make sure to remove any leaves below the water's surface. A second way is to root the cuttings in a growing medium. Start with a 5-6 inch branch-one that hasn't bloomed this year. Remove the bottom 2 leaves from their leaf nodes (the point where they attach to the branch). With a scissors, cut the largest of the remaining leaves down to half their size. Insert the cutting into a damp growing medium (vermiculite works well). You can dip the cutting in a root hormone before potting it, but it's not necessary. Water it thoroughly, making sure you have ample drainage, and cover it with plastic. If possible, prop up the plastic with sticks to keep it from touching the leaves. Place the pot in bright light-avoiding direct sunlight. Let the soil start to dry out before watering again. In 2-3 weeks give the cutting a gentle tug and if you feel a little resistance, you have roots. Some cuttings can be rooted by simply putting them in water but others need to be dipped in rooting hormone first. I have a Hydrangea in my back yard in dark pink. My hubby has a lot of success with hydrangea cuttings and we have two beautiful ones. He says that he takes a cutting from a branch that hasn't had a flower on it, dips it in rooting powder and plant in a small flower pot. When it starts to grow at a reasonable rate then re-pot into a bigger pot. Hope this helps.